Cathi Fontenot, MD is currently the associate dean of alumni affairs and development at the Louisiana State University (LSU) School of Medicine in New Orleans. She attended undergraduate school at Oral Roberts University in Tulsa, Okla., where she received a Bachelor of Science in biomedical chemistry. 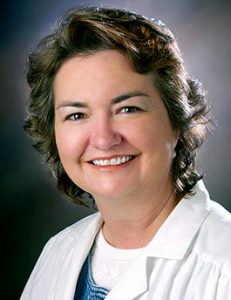 She received a medical degree from LSU New Orleans in 1984 and completed her internal medicine training at Charity Hospital in 1987, joining the School of Medicine faculty upon completion of that training. Fontenot served as medical director of the Medical Center of Louisiana (Charity Hospital and University Hospital) from May 2003 until November 2008 and as interim chief executive officer of that facility from July 2008 until January 2009. Fontenot, along with other staff, remained at University Hospital through Hurricane Katrina in 2005, finally evacuating with patients after five days without power or water. She was instrumental and intimately involved with re-establishing medical services in New Orleans following the storm, initially in tents in parking lots and ultimately in the renovated and repaired Interim LSU Hospital (formerly University Hospital). Fontenot has a long history of providing care to underserved and vulnerable populations experiencing healthcare disparities. She is board-certified in internal medicine and has a Certificate of Added Qualifications in geriatric medicine. She continues to see patients and has served as the volunteer medical director for the New Orleans Musicians’ Clinic since 1999 when it was founded. Fontenot is married with two children and enjoys working on the family farm as often as possible. She remains dedicated to her top priorities—family, patients and medical education.